Movie: The method of spin-resolved scanning tunnelling spectroscopy can as well be applied to paramagnetic systems, as e.g. single atomic spins. If this is done with an antiferromagnetic tip as a function of an external magnetic field B, the magnetization curve of this individual atomic spin, a so called single-atom magnetization curve (SAM) can be recorded . This is done in the following way. A spin-resolved image of an area with the atomic spins to be investigated is recorded at a magnetic field of Bstart. Then, the tip is retracted and B is changed to the next value. The tip is approached and the next spin-resolved image of the same area is recorded. This is continued until the magnetic field has reached the end value Bend. 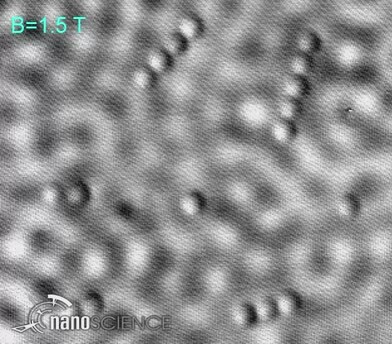 As an example, the movie shows a sequence of spin-resolved images of an area with two individual Fe atoms, two pairs of Fe atoms, a three-atom, a four-atom, and a five-atom chain of Fe atoms adsorbed on the Cu(111) surface. Acquisition of each individual spin-resolved image (I = 600 pA, V = -10mV, Vmod = 5mV) of the sequence took 20 minutes. 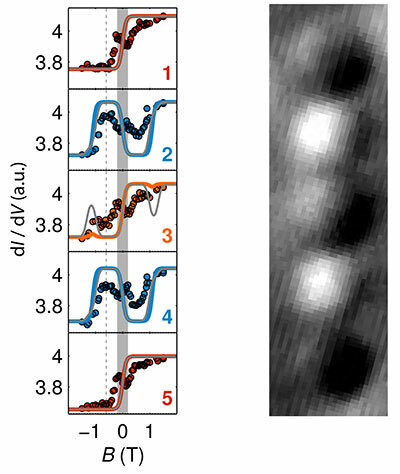 Each image was recorded at the magnetic field value B indicated on the top left corner, which has been incrementally ramped from Bstart = 1:5T to Bend = -1:5T, and back. .
Fig.1: Such a sequence of spin-resolved images is then used to extract the SAMs of each individual atomic spin within the image area by averaging the signal in a small area on top of each atomic spin (and on several substrate spots for calibration purpose). 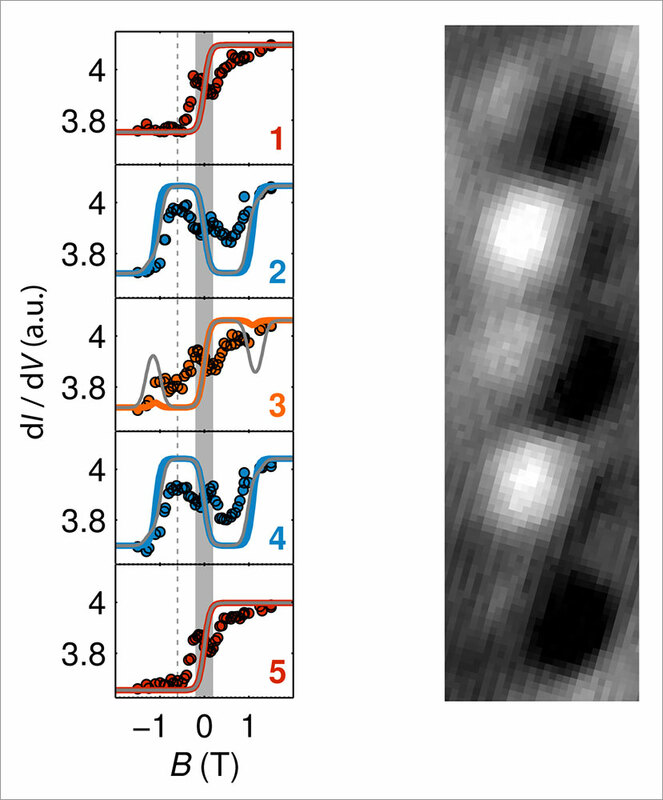 As an example, the figure shows the extracted SAMs of each of the five Fe atoms within the five-atom chain in the top right corner of the movie (dots). These SAMs can then be compared to model calculations (solid lines) . U. Kaiser, A. Schwarz, and R. Wiesendanger, Nature 446, 522 (2007). A. A. Khajetoorians, J. Wiebe, B. Chilian, S. Lounis, S. Blügel, and R. Wiesendanger, Nature Physics (2012).